The Scottish Youth Parliament is an organisation made up of 200 young people from all across Scotland. These MSYPs represent the interests of young people on a national level and campaign on issues relevant such as poverty, young carers and a fairer minimum wage. I have been the Member of the Scottish Youth Parliament for Angus North and Mearns for the past two years, representing the young people who live, work and are in education across the country from Shetland to Edinburgh at the National Sittings the Youth Parliament holds. The Elections for the Scottish Youth Parliament have opened and remain open until 4pm on Friday 13th March. Voters aged 12-25 living from Stonehaven to Edzell and all that is in between are eligible and have the choice to vote for my progressive policies that are achievable and important to the area. My first is to work on the state of employment for young people in the area. I believe in increasing the Minimum Wage to the level of a Living Wage, but unfortunately that is a difficult task to achieve in legislation. That is why if elected I will be engaging with every business in my constituency not only on explaining the benefits of paying a Living Wage, but also on work experience and training opportunities so that young people get a good deal from full and part time work not only in payment, but in experience. My second is to improve Personal and Social Education, which I have done a lot of work on in my last term. I presented a Member’s Motion on the subject, and it was passed with a strong majority in favour of including more real life skills such as finance, health and independent living. I will be working with Aberdeenshire Council’s education department in the months after the election to ensure that real life skills are at the centre of the subject and every young person in school will benefit from them being taught. My third is to increase the awareness of mental health. This is another issue that I’ve done a lot of work on, especially with the Aberdeenshire Youth Council, but I’d like to localise the efforts and make the campaign relevant to Angus North and Mearns. This policy is very important to me as I’ve seen lots of fellow young people go through various levels of mental stress alone, and I believe it is vital that we work together to reduce the stigma surrounding mental health, break down the barriers and make sure any young person with a mental health condition does not face it alone. My fourth and final policy is to achieve devo max for the Scottish Parliament. This is where the Scottish Parliament gets full control over all our own affairs except defence and foreign affairs or effectively, going independent but staying in the United Kingdom. I have always been in favour of devo max because I think it actually is the best of both worlds for Scotland, because we get to work as a successful nation with total sovereign power in our own hands but at the same time we are absolutely guaranteed all the benefits of remaining within the United Kingdom. I will campaign for devo max by lobbying representatives and working with any organisation that wants the same end goal. I have been an effective youth representative and with me going into sixth year with less pressure and responsibilities, I feel I can only improve. I want to represent the interests of every single young person in Angus North and Mearns but I need the support of you to help me achieve that. 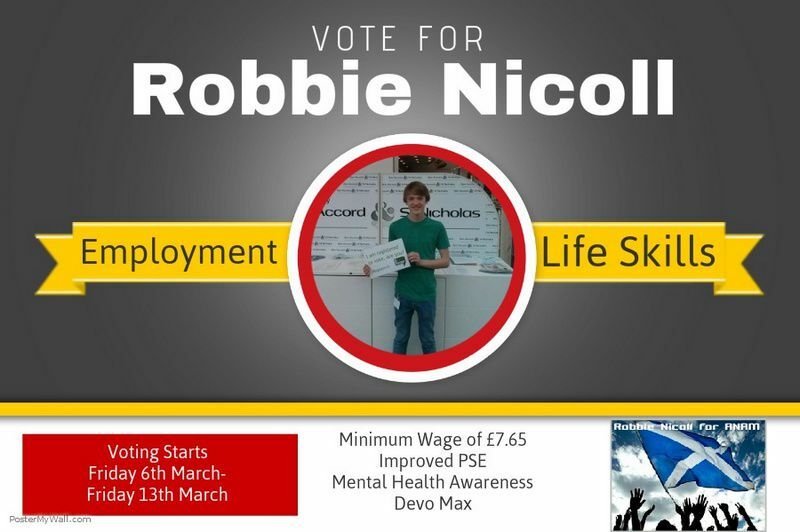 A vote for Robbie Nicoll is one for you and I hope you consider me worthy of the honour.